It’s been much too long since our last Paint Party! We finally have one scheduled for Saturday, April 21 at Pele’s. 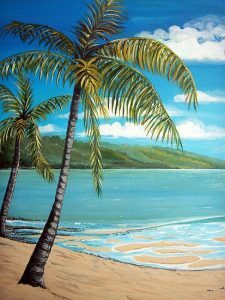 This event’s painting is a simple beach scene that is perfect for you to personalize with your own additions – lounging on the beach, boogie boarding, shark attack – use your imagination! We are limited to 12 seats and need a minimum of 6 to present the event, so come into the Art Center to sign up soon. For more information and to register on line, please go here. Unclaimed Clay – Need some help!